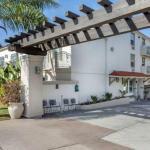 Along with the location just steps to Old Town attractions the free Wi-Fi and breakfast and easy freeway access are definite pluses for our guests at the non-smoking La Quinta Inn San Diego Old Town. This three-story hotel fits right into this Old Town neighborhood with its red tile roof terra cotta walls arched alcoves and sheltering palms. Inside the atmosphere is clean and contemporary with free Wi-Fi and mini-fridges and microwaves in all 79 non-smoking rooms. Amenities include complimentary breakfast with everything from made-to-order waffles to fresh fruit and pastries a large outdoor swimming pool a guest laundry and a self-serve business center. Pick up discounted tickets to SeaWorld the San Diego Zoo Wild Animal Park and LegoLand. There's on-site parking for a fee and pets are welcome. The hotel's Old Town location means you can walk to the many shops award-winning restaurants museums and historical sites in the neighborhood. The hotel is a five-minute walk to the Old Town Esplanade Shopping Center. Just as convenient is the immediate access to I-5 which gets you to SeaWorld Balboa Park the San Diego Zoo and San Diego International Airport in 10 minutes.